Roger’s fourth novel, this thriller with a dusting of science fiction features a devoted couple determined to do the right thing with an Austrian Crown Jewel suddenly in their possession. With what seems like supernatural help from a long-dead Civil War general, this 1980s couple tries to avoid cunning and desperate international jewel thieves, and return the treasure to its rightful place in Vienna. “The Civil War, past lives, Austria’s Crown Jewels and a story of love that transcends even the greediest of souls all converge in this satisfying thriller by Roger L. Conlee. The book finds police officer and history buff Tom Cavanaugh and his fiancée, the plucky Cass Nesbit, traveling to Vienna to return a precious jewel to its rightful owners. But Tom–who’s begun having oddly realistic dreams about being a soldier during the Civil War–soon uncovers a nefarious plot by someone who wants the priceless gem, at any cost. And then the Föhn begins to blow. Legend has it that the souls of the dead ride the Föhn , something the pragmatic Tom doubts. The “lanky narcotics cop who’d rather be teaching history” is always on alert, doubtful of everyone, casing joints with his reflexive cop’s instincts; Cass, with her more tolerant nature and quick wit, is a smart foil for Tom, and gives the book a softer, more feminine edge and point of view. 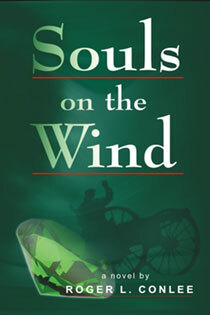 Souls on the Wind will appeal to fans of suspense who like to exercise their brains while reading, whether it be learning about symbols, a la Dan Brown, the stark landscape of Sweden, a la Stieg Larsson, or history tinged with a bit of science fiction, as in Conlee’s tale.